MediaTek's Helio X30 chipset beats Snapdragon 820 in AnTuTu benchmark testing? 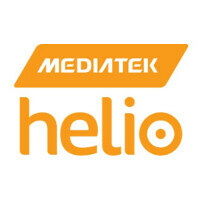 Late last month, we told you that MediaTek was reportedly working on the Helio X30 chipset. Today, analyst Pan Jiutang confirmed the existence of the chip. The Helio X30 is expected to be built by TSMC using the 10nm FinFET process, making it twice as efficient as the Helio X20. The new SoC will employ ARM's new Artemis cores along with older Cortex cores, and will continue to employ the tri-cluster designed used by its predecessor. While Jiutang's post didn't include a breakdown of the X30's specs, the information that we passed along last month calls for it to be equipped with a pair of 2.8GHz Artemis cores, four 2.2GHz Cortex-A53 cores and four 2GHz Cortex-A35 cores. The PowerVR 7XT GPU will handle graphics. The Helio X30 will support a dual camera set up, a 26MP camera, VR connections, LTE Cat.13 connectivity, and 8GB of RAM. 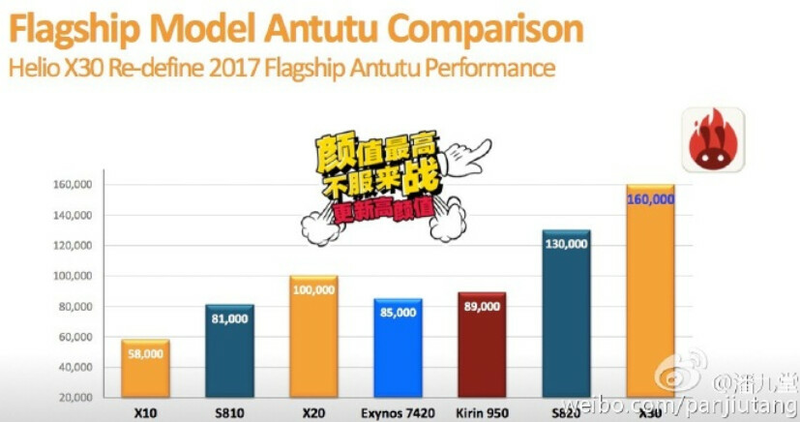 On his Weibo page, Jiutang posted a chart comparing AnTuTu benchmark scores of various chipsets. The Helio X30 scored 160,000 on the test, topping the list. Right behind was the Snapdragon 820 SoC, currently the latest and greatest chip offered by Qualcom and employed on devices like the Samsung Galaxy S7 (in the U.S. and China), LG G5 and the HTC 10. The Helio X20 SoC, MediaTek's first chip to feature a deca-core CPU, was next with a score of 100,000. I think it would be a pretty poor show if a deca core CPU couldn't beat a quad, lol. Question is, how hot does it get and can it achieve those scores once packaged in a phone? Your point is invalid.. many octocore soc get beaten by quad core even dual core in some cases. I think you're rather a bad comedian, or "your sense of humour is invalid" is just a bad excuse. I didn't find it funny. If that can be called "funny", anything can be, marorun's is, mine is. Cores, clock speed, layers, etc., all mean squat if it's not optimized with the rest of the hardware and more importantly software. Sure it does. You can optimize or you can brute force. May be the Snapdragos use Cluster Switching instead of HMP. I don't think that the 10nm process will be ready for the Helio X30, as the article suggests. I expect it for 2017 the earlier. Any thoughts on that? The A9X gets like 180,000 so this isn't impressive. I know the A9X is a tablet SOC with more thermal headroom but the A9 is equal to the A8X so a process advantage should've help them attain tablet performance in a smaller package. I'm guessing the GPU is holding it back. HTC is known for benchmark boosting. That is cause F-sync is turned off. You will get red score in UX or 3D but either way Antutu is the champion for the crappiest benchmark on phones. Helio x30 should be compared to exynos 9 and snapdragon 830. And the thing is every generation of chips have been almost doubling performance as far as ANTUTU scores go. Only beating out the 820 by 30,000 is not impressive. Lol.. Actually funny to say it that way.. When you have 10 cores, multi core performance should be less of a deal, single core or even quad core matters way more, yes android can use lots of cores, but not app uses all core equally, most apps use 1-4 cores most while the others are used less. Yes, but there's a lot more processes running than just the foreground app. If you can keep the core(s) the app is using dedicated to the app, that can't hurt. PowerVR 7 is a vast line of different GPUs. Remember that PowerVR 6XT in Mediatek isn't the same as A8's PowerVR 6XT. That would still be a whole gen behind SD 830 and Exynos 9. Samsung also used to make same mistake.. Now, Exynos 8890 actually performs better than SD 820 in even gpu department without that core boost made to score higher in benchmarks without cheating. Samsung never used weak GPUs in top class chipsets.